If you’re on a mission to get your pet’s health back on track, equipping your pet with the most innovative and highly researched electronic pet gear is one of the most effective solutions that’ll surely cut the veterinarian bill in half. A popular electronic pet gear that’s currently a bestseller and favorite amongst pet owners comes from the design labs over at PetSafe and elevates the meaning typically associated to sticking to a diet. PetSafe Automatic Cat Feeder is the optimal device that will offer permanent measures to improve your pet’s diet without making a massive dent in your wallet. 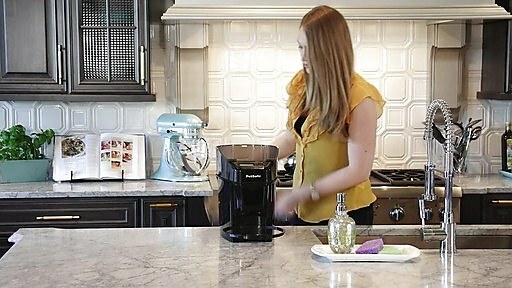 Keep reading for a detailed review of PetSafe Automatic Cat Feeder. You no longer have to continually worry about whether or not your cat is eating properly since veterinarians came together to help design the food portion mechanism that's unique to PetSafe Automatic Cat Feeder. A product that's earned a thumbs up from the veterinary community will undoubtedly be one that'll enhance your pet's well-being without a doubt. PetSafe has been around since the early 1990’s, so it makes sense that it’s now one of the biggest manufacturers in the electronic pet gear market since it’s had over 20 years to hone its products. The same can’t be said about competing manufacturers in the electronic pet gear market, which explains how PetSafe solidified itself with a superior reputation that claims it to be the leader in the pet gear industry. PetSafe dedicates its time to unlocking innovative designs as well as applying advanced research knowledge to create products that will put a smile on both your face and your pet’s face, which at the end of the day, is what every pet owner needs. People in over 50 countries have placed their pet’s health in the hands of PetSafe, so you can join the ranks of pet owners whose lives have significantly improved since their pets are even stronger than they’ve ever been. 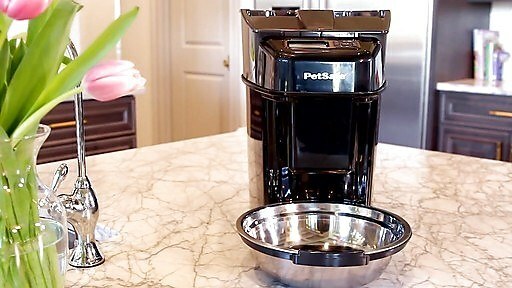 You can take control over every second of your cat's diet when you properly utilize PetSafe Automatic Cat Feeder. Before you even attempt to play around with the program control options, you should adhere to the quick start guide so that you can familiarize yourself with the PetSafe Automatic Cat Feeder. You can program a maximum of 12 meals a day, which means you no longer have to physically be at home to be able to feed your pet. Your cat will associate the sound of its food hitting the stainless steel bowl as a beckoning to eat, so you can forget about having to hire a sitter for when you're busy at work. The programs you choose dictate the speed and amount of food being dispensed for your cat to consume, so you have to carefully consider your program options, which include Immediate Feed Mode, Pause Feed Mode, and Slow Feed Mode. Buyers rave about how easy and effortless it is to utilize PetSafe Automatic Cat Feeder, which further proves the difficulty associated with operating a competing automatic cat feeder. Fortunately, once you take the PetSafe Automatic Cat Feeder parts outside of its box, you should only expect to take you a total of five minutes to assemble the product. Don’t forget to adhere to the in-depth manual that PetSafe specifically wrote since it’s proven to simplify the whole assembly process. On top of the manual, PetSafe went above and beyond to include a quick start guide which gives you a concise yet thorough run-through of how to operate the various feeding programs unique to the PetSafe Automatic Cat Feeder. 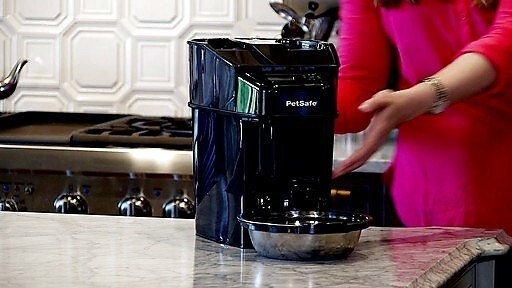 In regards to design, PetSafe took all the suggestions buyers had and put them to good use. This means that with the new and improved PetSafe Automatic Cat Feeder, the product evolved to include a large and bright LCD screen that makes choosing a feeding program as simple as using your smartphone. Based on positive buyer reviews, both you and your pet will benefit from the portion control system PetSafe Automatic Cat Feeder provides. In fact, once you incorporate PetSafe Automatic Cat Feeder to your in-home environment, you'll witness how quickly the times you have to take your pet to the veterinarian for a checkup will dwindle. Keep in mind that sharing a feeder between two pets is only plausible when their diets overlap and consist of the identical ingredients. In some cases, one of your cats may be on a special diet that makes it impossible to share a PetSafe Automatic Cat Feeder with your other cats. You can play it safe and assume that the PetSafe Automatic Cat Feeder you're buying is meant for one of your pets, so no territorial confrontations between your pets have to take place. Out of all the online vendors that sell PetSafe Automatic Cat Feeder, the one retailer that a majority of buyers trusts the most is one hundred percent Amazon. You can’t find better deals than what Amazon has to offer, and those searching for PetSafe Automatic Cat Feeder are in luck. On top of providing a 20% discount off the original price of PetSafe Automatic Cat Feeder, Amazon goes above and beyond to offer an additional 15% coupon. For under $120, you can provide your cat with the tools to promote a healthy lifestyle. Ultimately, it’s no surprise that maintaining a healthy body starts with regulating your cat’s food portions and diet, which is why you can’t go wrong with splurging on a PetSafe Automatic Cat Feeder. This is the perfect pet gear you can spend your money on since it's not only built to cater to your cat's dietary needs but comes with additional features that will cater to your mental needs as well. I would highly recommend buying PetSafe Automatic Cat Feeder since it removes all possibility of human error in regards to portion control, so your pet consistently eats accurate food portions 12 times a day.